Welcome to the new sweet spot of content and tech, a hybrid that forward-thinking marketers are smart to embrace. 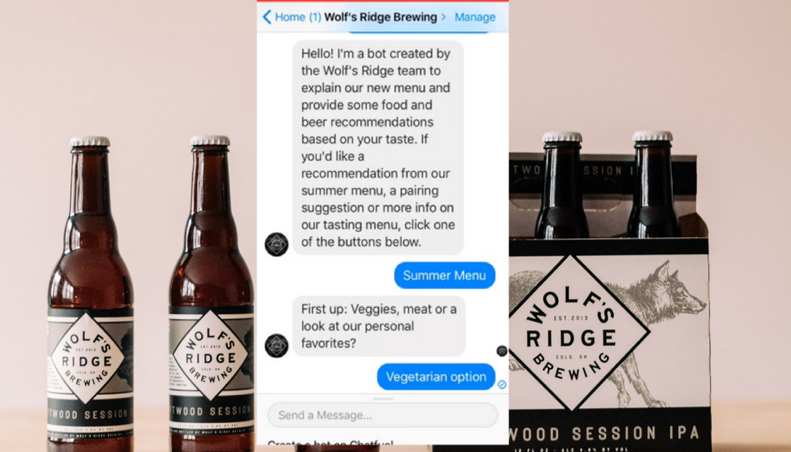 When Wolf’s Ridge Brewing needed help directing guests’ attention to their talented chef’s cuisine, Whaling’s team spurned conventional ideas such as social media posts, email marketing, media outreach, etc. The team didn’t use tech because it could, it used tech to show or tell the audience something. That’s the sweet spot for marketers who see technology advances as methods for evoking emotional engagement and serving specific business goals. Encourage observation and reflection: Ask your team to monitor (and share) new tools as they emerge, including use cases, potential applications, and foreseeable risks or pitfalls. Create a technology sandbox: Give your team a space for hands-on experimentation to build skills and experience in-house before offering the innovative solutions to clients. Require ideation: Ask for and collect imaginative ideas from your team to encourage brainstorming. You likely won’t implement every zany one, but you’ll develop a culture of gutsy, clever, prolific proposal-making. Nourish curiosity: Hire naturally innovative people and give them the space to do just that. Once your team is empowered and equipped to think differently about technological tools, it’s time to build your case for clients and stakeholders. 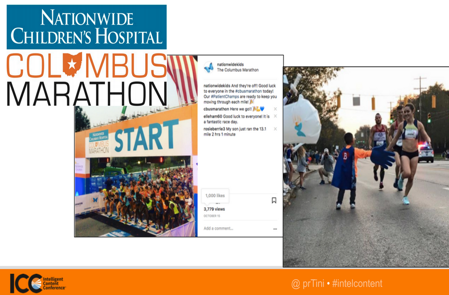 Heather’s team worked with Nationwide Children’s Hospital Columbus Marathon, which draws about 20,000 athletes and 100,000 spectators. They wanted to differentiate the marathon using technology. Before mulling all the bells and whistles, the strategists examined the event’s best performing content and found that the top piece was the countdown clock on the website. What if this anticipation-engaging content could be used in more ways, infusing the brand story with the audience’s daily narrative? Heather’s team created an Alexa Skill that let users ask how many days they had left to train until the big day. Having the countdown available verbally at any moment was a gift to an already engaged audience who relished the anticipation. Clarify what you want to prove. If you had only one thesis, one claim, or one data point to share, what would it be? Forcing yourself to distill your points to the minimum lets you work backward to fill in only the necessary details. You won’t overload decision-makers with less relevant factoids. Create an appendix or searchable addendum in your documented business case. Organize secondary points here for impromptu inquiries and to equip your superiors or clients with the data to dig into on their time. Make yourself available to answer questions that may arise from the appendix. Recall your original objective. In the brewery’s case, it was getting guests to embark on a great culinary experience. To the marathon organizers, it was better, more delightful touchpoints to build anticipation for marathoners and their supportive friends and family. Identify insights related to the original goal and call them out when building your data-driven case. Look for success in unlikely places. If the coveted upward trend line doesn’t pop out immediately, look for another positive outcome to highlight. Point out curiosities. Reveal a data blip or trend no one predicted. Invite stakeholders to participate in the analysis by speculating on consumer behavior. Vocalize the ramifications if these curiosities go on unaddressed. Suggest your team as the solution. You’ve shown your value, taught decision-makers how to approach problems with more confidence, and uncovered more opportunities to deliver similar results. As Heather illustrates, you don’t have to invent a new technology to be an innovator, you need to create a culture where innovation is embraced to take advantage of new technologies. 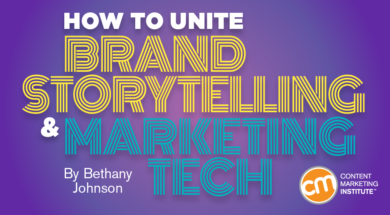 You must operate in an environment where you and the team can think about unique ways to tell your brand’s story that will engage and delight your audience. What cool new solution would you suggest if your team, stakeholders, and clients were all on board? Meet where the storytellers and technologists will gather Sept. 4-7 in Cleveland, Ohio. Register today to attend Content Marketing World. Use code BLOG100 to save $100.